Over the past few years we have been force-fed statistic after statistic about how dangerous football is to the brain health of our players, and participation has declined nearly everywhere across the country.While it’s a given that playing in the NFL is inherently more dangerous than playing high school football, prep coaches from the youth level to varsity level almost everywhere are fighting the stigma with parents that football is unsafe for their child. However, one Stanford researcher has a differing opinion, with some interesting statistics to back. This tweet sums up the sentiment. After doing some digging, I came across the article that coach Hughes is referring to that contains that information in the tweet. The article was written by a physician and Stanford medical researcher back in December, and his take can be read in its entirety here.. Interestingly enough, the author’s name is Ed Riley, and he is the brother of Nebraska head coach Mike Riley. As Ed (who has a son that plays high school football) points out in the piece, “adolescence is a scary time for parents,” and while he worries about his diminutive son lining up on the front line of a kick off return unit, it’s only slightly less than the worry he feels when he gets behind the wheel. Riley’s article is really well done, and has some great statistical information, while at the same time being written from a concerned – yet informed and realistic – parent’s perspective. Give it a look, and pass it on to concerned parents if necessary. Growing up on the West Coast, I played every sport I could - soccer, basketball, baseball, tennis, I swam and for a short period I was even in a bowling league, but the only time I got to play football was at school during recess. I am pretty sure that the universal rules of recess football are still the same: Two-hand touch (when the recess lady was watching), one run per every four downs, two completions for a first down and we always debated whether we were going to count “Alligator” or “Mississippi” to rush the passer. My parents never allowed playing organized football to be an option for me. They didn’t want me to get hurt. In the spring of eighth grade, the high school football coach came to our middle school to talk to a bunch of us about playing high school football. I was interested in soccer and the other sports at the time but playing football was definitely intriguing. My mom still would not let me play. For two more years I continued to play other sports, and on Friday nights, as the football team played under the lights, I sat with the rest of the student body and watched. I really wanted to play, but my mom wouldn’t budge. In the summer between my sophomore and junior year, unbeknownst to me, a group of my friends’ parents ganged up on my mom and convinced her that she would really regret it if she didn’t allow me to play. Amazingly, she finally relented and said I could play! I played that season of football and fell in love. I have not missed a football season since that fall of 1985 and my life has never been the same. The game of football has so much to teach and so much to give. Football taught me what it means to be a part of something bigger than myself. Success in football requires selflessness and true teamwork. It is impossible to have any kind of personal success without your teammates – impossible. No matter how talented an individual might be, he will never win one versus eleven. In a powerful way, the game of football is very humbling as it demands that players put the team over the individual. A football team is unlike any other, in that it depends on all kinds of body types and skill sets. Short, tall, stocky, thin, fast, not so fast, strong, not as strong, cerebral, and hardheaded - they all can have a place and a position on a football team. There are so many different roles and positions and every one of them matters. Football teams break down race barriers better than anything else I have ever been a part of in my life. When you are in a huddle holding hands you don’t see brown, black, white, red, yellow, or green. You see your brothers, your teammates who are depending on you, and who you are depending on to do their job. The best teams that I have been a part of truly love each other. When a young man gets the opportunity to be a part of that, he will never be the same. It is a powerful reality and one that the rest of society certainly could stand to emulate. In addition to teamwork, football develops toughness – mental, physical and emotional. The toughness I am talking about is not merely the ability to push another player out of the way or tackle the guy with the ball, but rather the refusal to be discouraged or distracted in the face of a challenge. Football teaches the value of hard work, the necessity of honoring commitments no matter what, and the unbelievable power of a positive attitude in the face of adversity. Because it is uniquely demanding, football has the ability to instill belief, self-confidence, and discipline. We all want our boys to grow up to be responsible and effective in life. 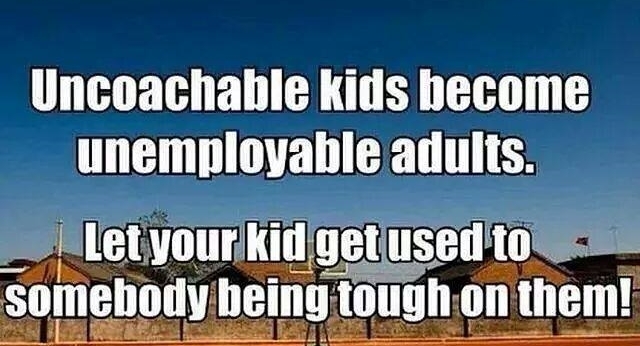 Being successful in life as an adult absolutely requires toughness. Maintaining a strong marriage, raising kids, developing a career, and sticking to a value system all require commitment, responsibility, and perseverance. In a culture that is raising boys that seek to be entertained rather than be challenged, I submit to you that no other game develops toughness that translates to success in life quite like the game of football. Unfortunately, the game of football is under attack. People are being steered away by the recent attention to concussions and other injuries. I am now a college football coach and have been for 24 years. I have a deep concern for the well being of every one of my players - I always have and always will. I am not an anomaly. We take concussions and all injuries very seriously. Over the last 10 years, we have seen significant changes in the rules of the game, the introduction of annual baseline testing as well as post-injury testing on athletes, improvement in helmet quality and fit, and dedicated training for physicians, athletic trainers, players, and coaches on the presentation and management of concussion. Player safety is definitely a focus in the game of football. Let it also be known that research shows that more concussions occur from riding bikes than from playing football and soccer tops the list when it comes to girls' sports. I have a daughter who plays soccer and loves it, and all three of our children ride bikes! Of course, I cannot tell you that your son will not have to deal with an injury from having played football and tragically some injuries end up being serious. I will tell you that awareness, preventative measures and care are at all time highs and from my 30 years of experience - the game of football gives so much more than it takes away. I cannot imagine my life without the invaluable lessons, situations, and experiences that football has provided me. I have experienced being a back-up and a starter. I have been the hero and the goat. I have been on an 0-10 team and a 10-0 team. I have suffered injuries and have seen guys end their career due to injury. I have seen the pain when players fail to make the team and the uncontrolled joy when players are told they are receiving a full ride athletic scholarship to play football in college. Football has taken me to play or coach in seven different countries, paid for my Master’s degree, and has allowed me to provide for my family my entire adult life. The experiences have run the gamut, but it is all worth it. The most valuable things that football has given me are the people I have met and the incredible lifelong relationships I have built along the way. I love my mom. She has never done anything but want the best for me. Thank God she ended up letting me play football. For that I will be forever grateful. To all you parents debating whether or not your son should play football – let him if he wants to do it. I wholeheartedly believe that the benefits far outweigh the risks. It is truly a life changing game!